Capital Chiropractic & Rehabilitation Center is very excited to partner with Kate Brown from BRAISED Bone Broth Company and Kitchen Collage of Des Moines to present this workshop! Bone broth is a great addition to your diet, celebrated for its rich nutritional profile. Learning how to make your own is a great addition to your culinary skills. 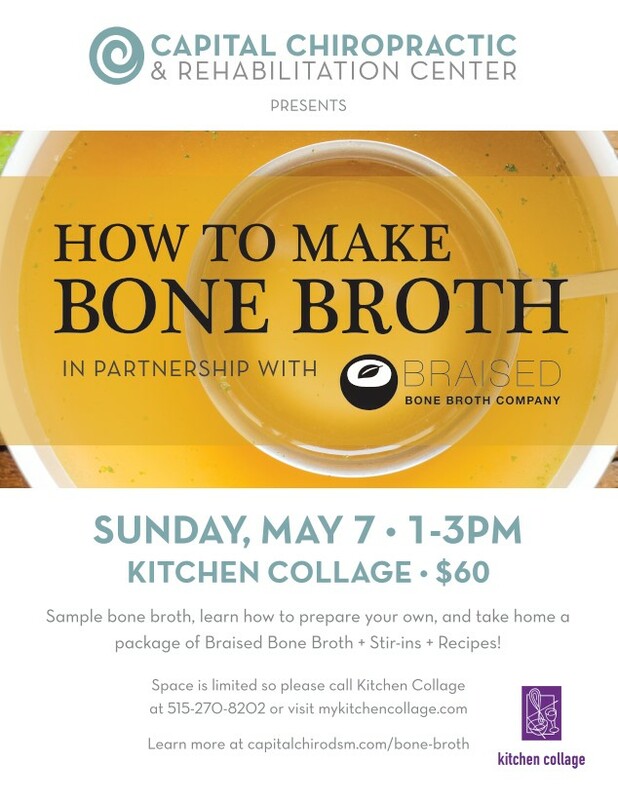 Join this workshop to sample bone broth, learn how to prepare your own, and take home a package of Braised Bone Broth, complete with stir-ins and recipes! Kate Brown has spent the last 13 years working in the functional healthcare …setting providing nutrition and lifestyle education. She practices and teaches The Paleo Diet, although her approach is integrative – with both scientific and intuitive insight – to best serve the individual needs of each client. Services include healthy lifestyle design, meal planning, customized coaching, elimination/anti-inflammatory diet education, specialty cooking classes, grocery tours and other food-sourcing tips. Kate graduated from the University of Wyoming with a B.S. in Human Food and Nutrition / Pre-Medical Emphasis, but points to her own journey of seeking better health from a state of chronic concern as her best teacher. In 2015 Kate founded BRAISED Bone Broth Company, crafting nutrient dense foods that are “consciously convenient” to serve busy families like hers seeking optimal health. She is a devoted student and instructor of Adamantine Yoga and has 2 children ages 10 and 6 months.